Strengthen bones and teeth with the best calcium-magnesium supplement! * Made from pure milk, nature’s best and purest calcium source, but safe for those who don’t consume dairy. Strong bones mean a strong body! 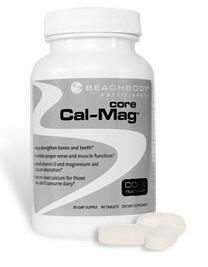 Beachbody’s Core Cal-Mag is the best calcium-magnesium supplement, “no bones about it!” Here’s the deal: together, calcium and magnesium are required for over 300 metabolic and critical biological processes, yet studies show that most of us don’t get enough of either in our diets—which means the body has to take unhealthy shortcuts. Calcium is essential for healthy bones and teeth, and it’s true—critical for the prevention of osteoporosis. * The calcium in Core Cal-Mag comes from nature’s best calcium sources—pure milk and calcium carbonate. Plus it contains no lactose, protein, or milk allergens, so it’s easy to get an adequate supply of calcium daily, even if you don’t drink milk regularly. And here’s a supplement-industry dirty secret: some calcium sources have a risk of lead contamination! But not ours! Core Cal-Mag is good for you!